Hello and Thank You for visiting The Motor Masters for collector cars for sale! 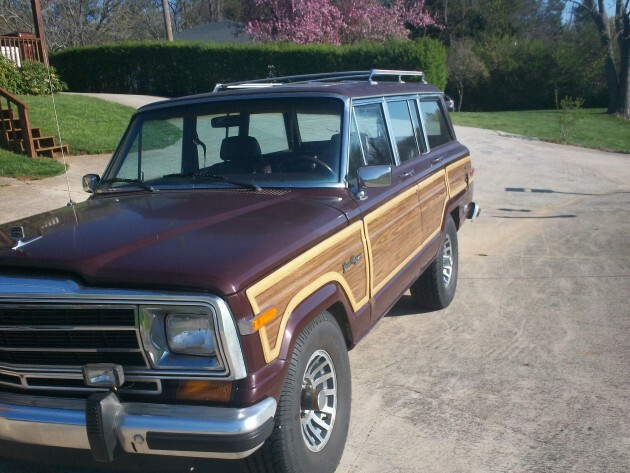 We are currently listing a 1987 Jeep Grand Wagoneer for one of our clients. It is Burgandy with Burgandy Interior and has 91,839 Miles. If you are looking for collector cars for sale, here’s one to keep your eyes on. This Jeep is NOT a Restoration….it is being sold AS IS. All Electricals WORK except the locks. We think there is a short somewhere. The Jeep has a Sunroof and it works. The Paint is ORIGINAL and will need a new paint job. Radio and Cargo Cover are Factory. Woodgrain is ORIGINAL and is in EXTREMELY GOOD SHAPE….A 9/10! Tailgate Window works both inside with switch and outside with key. There is one rust hole the size of a quarter located on Rear Quarter Panel. There are about 5 other Surface Rust Spots located on the Jeep, but not eaten through. There is a small crack in the windshield located on the drivers side next to the window post. It does not interfere when driving and you can see it in the pic. Interior is almost perfect. No tears or rips in the seats…EXTREMELY GOOD CONDITION! Carpet is in Good Shape as well. The only thing to replace is the Headliner because it has a couple of drips. Mechanically, this Jeep is SOLID! Everything is good and runs like a Champ. Cruise Control & 4WD Work Great. Oil & Filter has been changed with Penzoil. Air Filter has been changed. Vents open and cleaned. Differentials Fluids are Good and Full. Also Transfer Case and Transmission Fluids have been checked. Tires are good but need replaced because they are the wrong size. They are too big.The only reason why the Autocheck is low on this Jeep is due to the number of owners. THIS JEEP HAS NEVER BEEN IN A WRECK!!! IF YOU WOULD LIKE US TO RESTORE THIS JEEP CLASSIC, PLEASE GIVE US A CALL AND WE CAN GO OVER THE PROCESS AND PRICING. WE ARE RESTORATION SPECIALISTS WHO SPECIALIZE IN RESTORING YOUR CLASSIC AUTO!!!! !